The Red Line Transit System is almost here. While there may be a few temporary inconveniences, a connected city is a big long-term win for all of us. 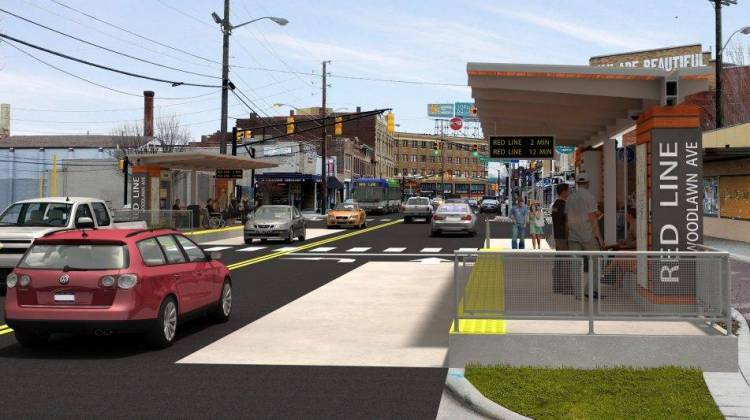 Once complete, the IndyGo Red Line Rapid Transit Bus system will provide access to Indy’s major neighborhoods and culture districts without the need for a car. Concertgoers should plan ahead. Beginning on or after Monday, March 18,Virginia Avenue will be closed to through traffic for approximately 150 feet just north of Woodlawn Ave for 1 week. This will have the greatest impact when traveling from Downtown to Fountain Square. The detour should be seamless but with the route running through small neighborhood streets, it could be congested at peak traffic times. If you have the option, we recommend navigating from the North (East Washington Street then head South on Shelby) or From the South (I-65 to the Morris/Prospect Exit). Use the WAZE app, which will automatically route you around traffic and construction, when you head to one of our shows. Our friends at the Red Line have provided this helpful map. Give yourself a few extra minutes to make it down to the shows, and take advantage of all the free street parking have near the Murphy Arts Center. Construction will be over before you know it. Once complete, you’ll have a shiny new transit line you can use to drop you off at our front door. We appreciate your support and patience during our neighborhood’s quick little transition, and we can’t wait to see you at a show.